This video from the Netherlands should be very amusing, even to those who voted for Trump. It is very clever. My good friend Boris offered to let us stay at his “House of the Dancing Parrot” on the Costa del Sol in Estepona, Spain. What an great location! 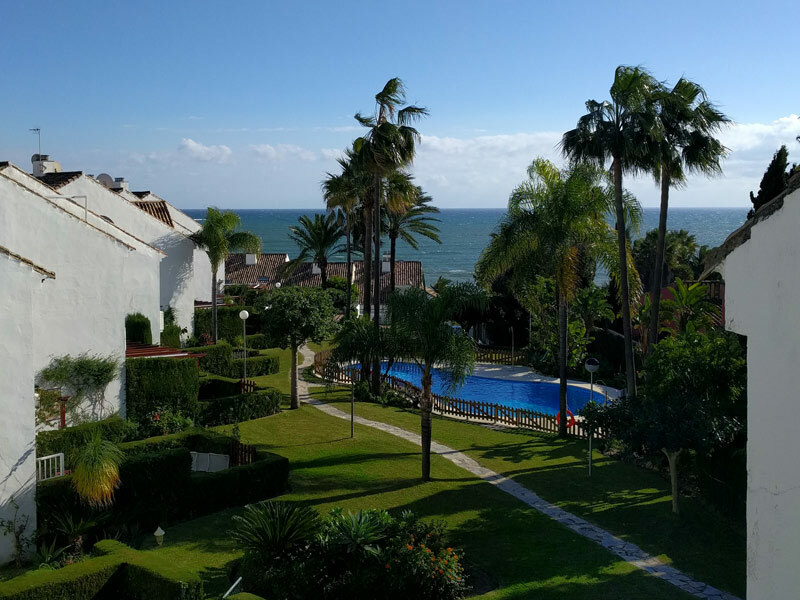 Here’s the view off the back terrace where we had our first cup of coffee in Estepona. San Diego looks a lot like the Costa del Sol, and I even saw names like “La Costa” (name of a Carlsbad, CA subdivision) on the drive from Barcelona. Basically, always sunny and almost no rain. January usually has about 10 cloudy/rainy days. It’s about 65 degrees outside right now and penetrating sunlight everywhere. If you are in the sun, it’s warm even with the constant ocean breeze. I can’t imagine a more perfect place to work on statistical analytics for the winter! Without any clouds, the evenings get cool. Kate is planning activities for the next month. We have friends from Denver who came and visited us at our Diamond Head home in Hawaii, and they are planning to visit us in January here. 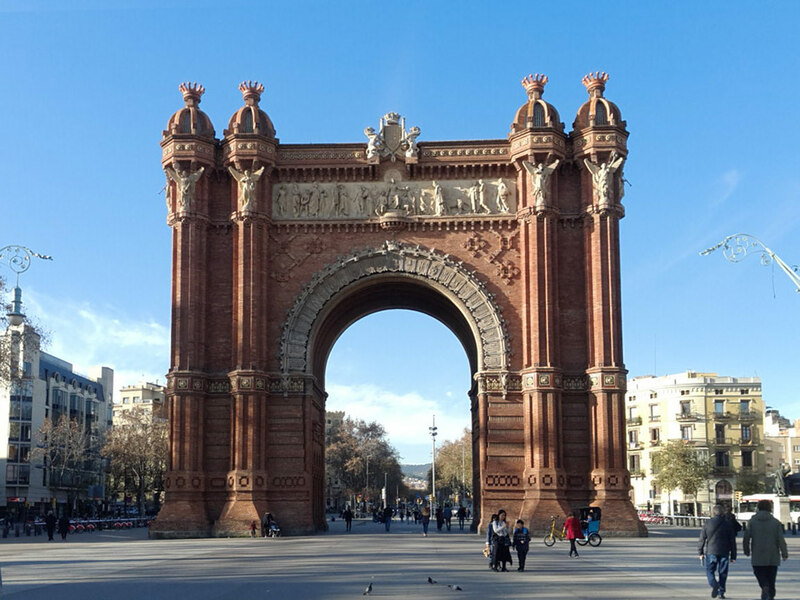 Barcelona is a spectacular way to spend the Christmas holidays. It’s not the kind of over-the-top Christmas that one sees in American cities where the holiday season begins before Thanksgiving. In Barcelona, the decoration is contained, more or less, to the street banner lights that create a festive scene as one walks around. The Christmas festivities include all sorts of performances. 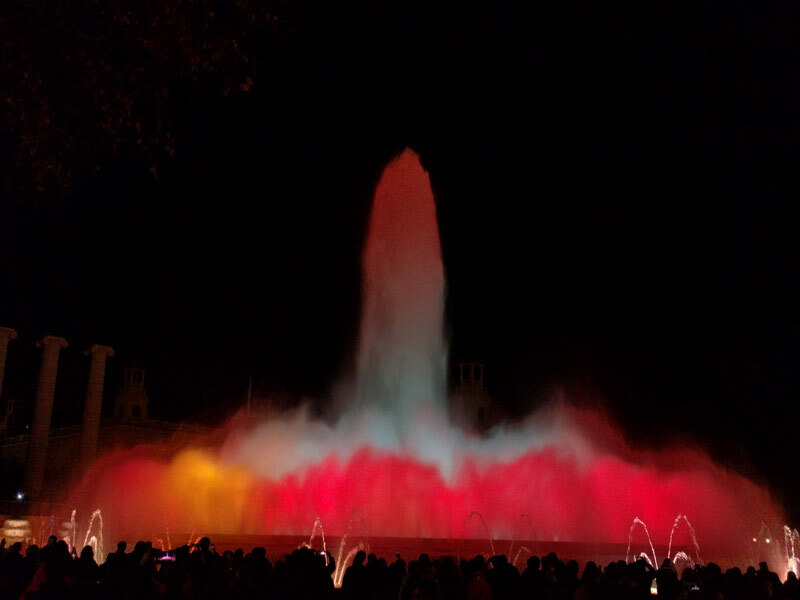 For example, we went and saw the music and water performance at the big fountains one evening. On Christmas eve, we went to two events. First we saw a flamenco performance at a marvelous performing arts center that was impressive and a UNESCO world heritage site in its own right. Then we went to the late mass at the large city cathedral where the choir performed a piece of midieval music that has been performed every Christmas eve for hundreds of years. That was truly a show. In between we had tapas and cocktails at one of the many tapas bars that was open that evening. I can’t really say enough about how grand this city is. It has a feeling like Paris in that it has grand boulevards, parks, sculptures and interesting archictecture at every turn. Take a walk of a few kilometers and you will see things that are just awe inspiring. Their Arc de Triomph is such an example. At least for me, that’s the same sense that I get when I walk around Paris. The Catalan food is also fabulous and appeals to the same elements as Italian food with tomatoes, olive oil, bread, and meats taking center stage. I did not have a bad meal here. A wonderful holiday, and a city deserving of a stay of a month or two. Tomorrow we head towards Estepona, Spain. What Dubrovnik has with old-world charm, Split has with vibrancy. Split’s history is older, with its Roman buildings dating back to the 4th century. 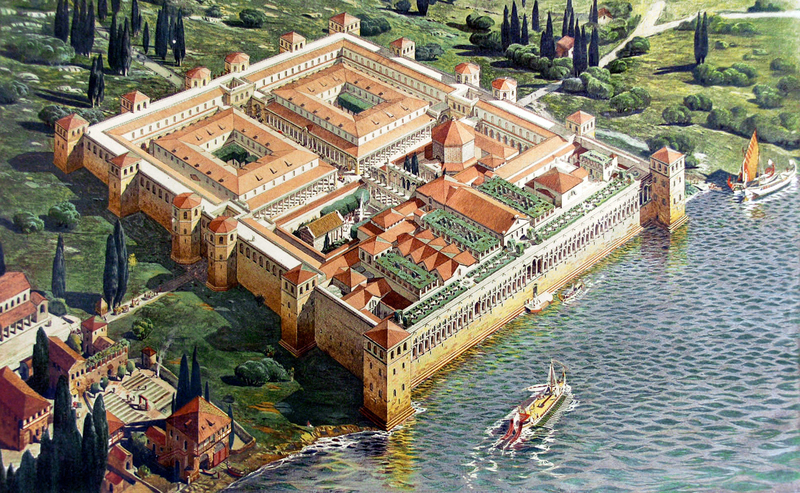 Here is an image of the Roman Emperor’s retirement home (which sported 700 servants). Some of the buildings are remarkable given their age. The construction was massive. In addition to the ancient buildings, there’s just a lot of commerce. As a port, one sees lots of travelers moving about off the ferries which go up and down and across the Adriatic to Italy. Many restaurants. Food is a lot less expensive than in Dubrovnik, and Kate and I bought a 12″ pizza and a foot long sandwich yesterday for a total of about $2.75. Coffee costs about $1.25 per cup and is excellent. Finally, I want to give a shout out to my Apartman Garden apartment building where we are staying. These people are FANTASTIC! Super responsive and FRIENDLY! Our Dubrovnik experience was mixed, but these people understand the ways of customer service. Let me give two examples. First, they had an espresso machine inside the apartment. I had some trouble operating it, and the assistant manager came over. He had some trouble with it, so they brought a second one. While we were working to set that up, the manager noticed that we were missing a little ring to create pressure on part of it. So, he got an extra ring, and I was in business. AWESOME coffee in the morning. My second example relates to the wifi. They have several wifi routers, and I had no problems the night before. But for unknown reasons, my machine was having some trouble this morning. I had noticed an Ethernet port on the wall, and asked about that. The assistant manager asked, “Do you want that turned on?” I said, “Heck yeah!” and pulled out my Ethernet cable. Within five minutes I had blazing speeds out to the Net. What really impressed me about this was the manager did not give me any grief about needing to help me. HE WAS HAPPY TO HELP ME so that I could get my work done. He was HAPPY to hear how happy I was with the Internet speed. Of course there can be issues anywhere you go when you travel. All you can ask is to have helpful problem resolution. In 7 months of travel, I haven’t seen any hotel or guest house as friendly and customer service as they are. HIGHLY HIGHLY RECOMMENDED. Here’s a link: Garden Apartment And just a 3 minute walk from the old town. I ran an experiment, and, sure enough, it came up paydirt with corruption. The postcards were taped together, and, absent an xray scanner (which customs surely has), one could not know that there was any cash in the mailing. The envelope was a high quality, well-made envelope from a French hotel with a destructible flap (i.e., one-time open). So, these Bulgarian customs people took the time to very carefully open the end of the envelope where it had been glued down in the manufacturing process. They took out the cards, took most of the cash, then put the cards back together, inserted them back into the envelope and resealed the envelope. To do this would have taken substantial time and effort. Do you know how much effort it takes to steam open an envelope with adhesive without messing it up? I found it amusing that they left a couple of dollars worth of cash as though anyone would conclude that it had not seen tampering. Honestly, why not take it all? I don’t believe that there was any sort of morality here. But I give these Bulgarian crooks, er…government officials….credit. Because it was a registered letter, they had to carefully disassemble it and then reassemble it, lest the Croatian post office system make a claim against them. In short, they had to cover their tracks. If I had sent an unregistered letter, it would have simply disappeared. I’ve heard much of Bulgarian organized crime and corruption, but here was petty corruption as close to being in the open as I have ever seen. I’m posting this message because tourists need to know that Bulgaria has corruption and that other countries in the Balkans have just as much to offer and are not as corrupt. Honestly, if you can’t trust customs and the post office to handle a registered letter correctly, who can you trust? The amount of organized crime beneath the surface must be staggering. While the citizens may have grown accustomed to this sort of corruption (I met other Bulgarians who NEVER use the postal mail), tourists do not have deal with it and go elsewhere. But maybe the place is just run by mobsters and even good government officials cannot put a stop to it. 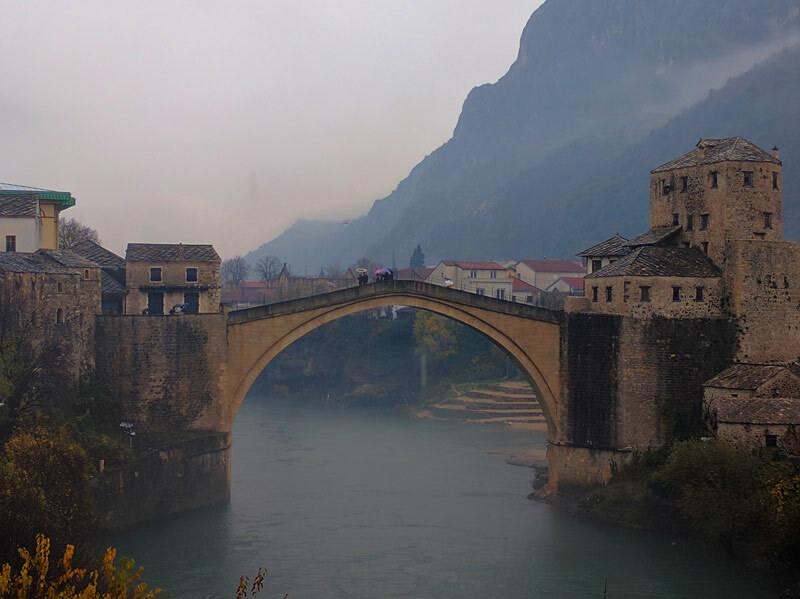 We took a day trip to Mostar, Bosnia & Herzegovinia. This town was under Ottoman rule with local people running the place. Even though the Turks did not come and personally control the town, Islamic culture, architecture, and food remain present. The town is very much trying to market this fact, making the famous bridge the iconic city symbol on its city flag. The architect for the bridge was the student of the architect that created the Taj Mahal. Mostari is the word for bridge keeper, and that’s how the city got its name. It is quite the city symbol. Even though it was a bit of a rainy day, the bridge pops from the photo with its white stone. If you are American and haven’t traveled much lately, I can only say that things have changed pretty dramatically when going abroad. I had avoided most travel after 9/11 until a couple of years ago when I finally resumed travelling. I definitely noticed how much the world has changed. Back in the day, let’s say the 80’s, before the breakup of the Soviet Union and the rise of China, I traveled a bit both as a student and for work. In general, I found that it was best to bring the stuff with you that you thought you needed. This view arose for two reasons: 1) it could be a hassle to find what might be commonplace in America; and 2) it was, in all likelihood, going to be more expensive. I now reject this view and conclude that Americans are living expensive lives paying more for the same inexpensive stuff precisely because they live expensive lives. In the past, I would have even brought batteries for my electronics. Not anymore. Do NOT buy an international cell phone plan unless you need to call back to America with your number. Most stuff for general living in most places is simply cheaper. I will give some examples. For example, food (specifically raw vegetables, fruit, meat, not processed food) in grocery stores in the Netherlands is probably about 2/3 the cost of food in American grocery stores. And better quality. Bakery goods are cheaper than US bakery goods too. In places like Bulgaria, cooked food is nearly the same expense as raw food if you are eating at non-restaurants. A giant slice of take-away pizza at one of the pizza shops will cost about 75 cents; two are an adult meal. There are little shops that specialize in takeaway grilled meats and cooked vegetables, and the cost is only slightly more than the raw foods. But one doesn’t bring food abroad, so let’s discuss other stuff. I brought an Apple iPad with a cracked screen with me on my trip. I got it fixed in Bulgaria for $75 by a super-skilled Bulgarian tech guy who had repaired Apple products in the US and returned to Bulgaria. I had priced it in America, and Apple wanted $400 at their store, which basically means “buy a new iPad.” The machine works AWESOME now. Eveready batteries were cheaper abroad than in America. I couldn’t believe it. But I didn’t buy them because I bought Aerocell batteries, a European alkaline battery that is just as well made from all appearances, and I paid about half the price. Cell phone SIMS are very cheap. I bought a Bulgarian card with 100 minutes and 1GB data for $5. In the Netherlands, I paid only $10. International calls will probably be more expensive, but they are probably cheaper than using your out-of-sight American plan. Frankly, I can’t believe that Americans tolerate their astronomical cell phone bills. Clothes. Even clothes are cheap. With Chinese manufacturing and a market economy everywhere in the world, textiles are everywhere. Which means that you can leave your American clothes behind and pick up some clothes that are local and you’ll stand out less. And you can bring them back to America and it won’t have been any more expensive. The point that I am making is that America no longer is the marketplace with the best quality products at the lowest cost. Globalization and the market economies everywhere have completely altered that past reality. Admittedly, you will NOT find 150 brands of cereal in the store, but you will find distinct local varieties at lower costs than America. For example, in food, there are varieties of stuff that we would find familiar, but even better, and at low cost. In Croatia, I buy an Oatmeal that has some other grains blended in it, and the nutty, tasty flavor is great and it’s cheaper than American oatmeal. And it goes even further. Some policies abroad, like the regulation of medicines, mean that the cost of medicine is much less than in the United States. Kate got needed antibiotics for an infection straight from a Malaysian pharmacy for a few dollars; the co-pay in America would have exceeded it. This is why “travel medicine” has arisen where people go to India for major surgeries because the total cost for the surgery, hospital, recuperation time, medicines, and travel expense are less than what would paid by having the work done by the doctor down the street in the United States. Think about that. 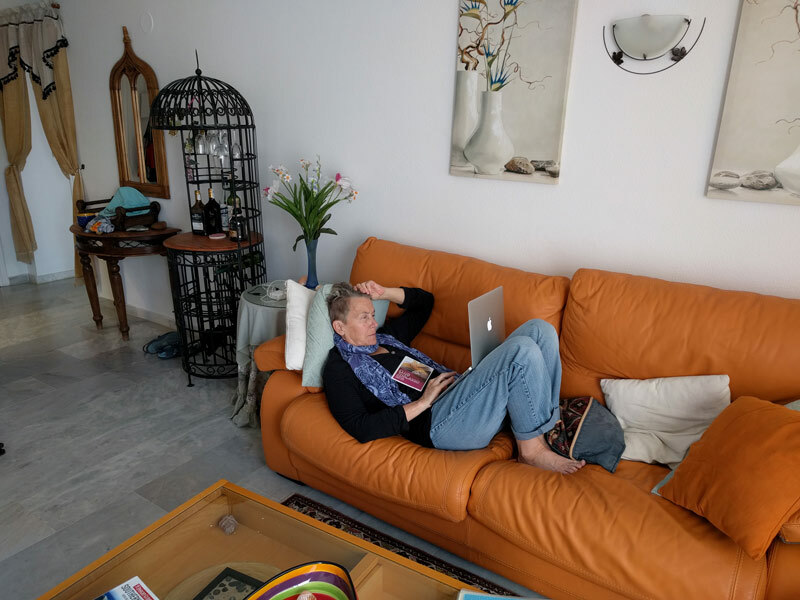 It has gotten to the point where if you have a work-at-home job for a US company, it makes economic sense to work from abroad. There may be many factors (two: friends, family) that probably dictate otherwise. But the economics of earning a high wage and living where it can be leveraged is obvious. Because the past advantages of living in America no longer apply. The sales pitch that “America is Number 1” seems to me to be more like whistling through the graveyard of trying to avoid a certain fear more than a real sales pitch.